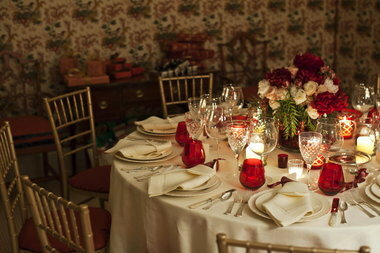 Tips - Getting your home ready for Holiday Entertaining! Remove crayon marks or wax spills on the wall by blow-drying the stain on high heat until the wax melts, then soak it up with a sponge. Remove permanent marker by dabbing the surface with a cloth or cotton ball covered in rubbing alcohol. Crayon stains on a wall - Make a paste of baking soda and water or spritz WD40 and wipe with a paper towel followed up by a cloth with hot water and some dishwashing liquid mixed in. Stop silver from tarnishing - Wrap chalk in cheesecloth and store with silverware (or jewelry). The chalk absorbs moisture and helps prevent tarnishing. Tumble dry pillows in a hot dryer once a week for 15 minutes to freshen them and get rid of dust mites. To make cut flowers last longer, add 2 tablespoons of vinegar and 1 teaspoon of sugar to the water. To clean crevices and corners in vases and pitchers, fill with water and drop in two Alka-Seltzer tablets. The bubbles will do the scrubbing. Never put citrus fruits or tomatoes in the fridge. The low temperatures degrade the aroma and flavor of these persnickety fruits. Don’t store your bananas in a bunch or in a fruit bowl with other fruits. To keep potatoes from budding in the bag, put an apple in with them. Keep iceberg lettuce fresh in the fridge by wrapping it in a clean, dry paper towel and storing lettuce and paper towel in a sealed baggie in the fridge. To clean mineral deposits off a showerhead or faucet, pour a little white vinegar in a zip-top bag. Rubber-band it to the showerhead and soak for a half-hour. Rub chrome fixtures with wax paper after cleaning to prevent water spots and finger smudges. Make cleaning a greasy pan a lot easier by shaking a little salt on the pan before washing because salt absorbs most of the grease. Get rid of a lingering smell in the kitchen by baking orange peel in the oven. Get cooking grease off a wall by sprinkling some cornstarch on a cloth and rub the spot until the stain is gone. To get rid of stains and mineral deposits in a coffee pot, fill the reservoir with 1 part white vinegar and 2 parts water, then brew. Repeat every three weeks. Keep windows frost-free by rubbing the inside of the window with a sponge dipped in salt water. For streak-free windows and mirrors, wipe them using newspapers.